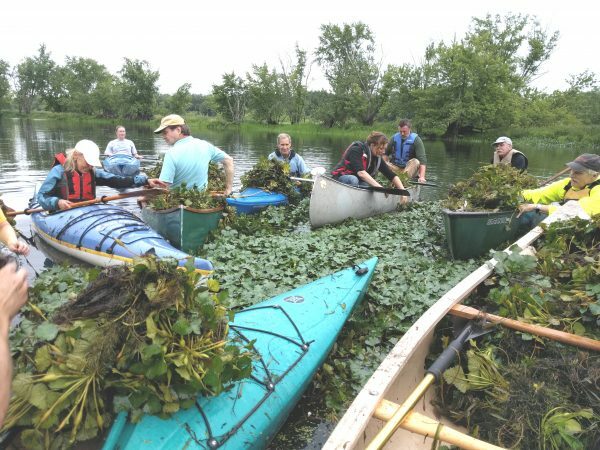 The aquatic plant known as water chestnut (trapa natans) showed its invasive potential last summer at many points along the Connecticut River and its tributaries. In our own Floating Meadows, the freshwater, tidal marshland formed where the lower Coginchaug and Mattabesset Rivers converge, the presence of these plants was first recorded in 2009. The Jonah Center has been monitoring the area closely since 2013, pulling out a few plants each year through 2015. The summer of 2016 was different! Water chestnut proliferated as we have never seen before, forming expansive, dense patches at multiple locations. Left unchecked, these plants can choke off sunlight and oxygen, threatening native plants, fish, fish-eating birds and other aquatic species. Some waterways, including local ones, have become impassible by water chestnut infestations. For the coming season, paddles were held on June 10, June 24, and the third is planned for Saturday, July 8, 9-11 a.m. (The time of the July 8 paddled has been changed to 9 a.m. because wind conditions on the earlier afternoon paddles were a major obstacle to progress. In case of bad weather on July, we will attempt to go out on Sunday, July 9, at 9 a.m.) Canoes and kayaks will start and finish at the launch site at 181 Johnson Street, adjacent to Middletown’s recycling center. For each of these outings, we need many volunteers, including those with access to motorboats. Here’s why.